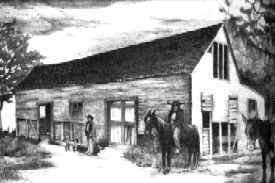 The ad interim government of the Republic of Texas was formed at the Convention of 1836, which met in primitive quarters at Washington- on-the-Brazos from March 1 through March 17, 1836. 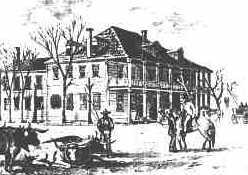 After winning independence from Mexico at the Battle of San Jacinto, the first permanent government of the Republic was elected under President Sam Houston, and met in this building at Columbia in the Fall of 1836. 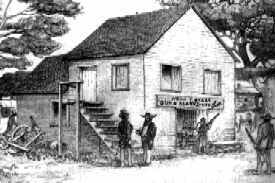 The newly founded town of Houston served as the seat of government from the Spring of 1837 until November of 1839. The building was constructed at the corner of Texas Avenue and Main Street. 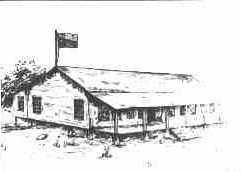 In November of 1839, the Congress of the Republic first met in Austin. Because of the exposure of Austin to the hazards of the western frontier, however, the government met in Houston and at Washington on the Brazos between 1842 and 1845. Because of the exposure of Austin to the hazards of the western frontier, Sam Houston convenend Congress at Washington-on-the-Brazos in 1842. 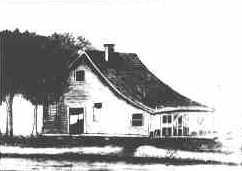 The government operated from here and the town of Houston until returning to Austin in 1845. 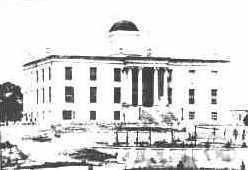 An election held in 1850 reaffirmed Austin as the capitol, after which this building was completed in 1855. The building served as the capitol for just over a quarter of a century before it was destroyed by fire in 1881. From these temporary quarters in Austin, the Texas Legislature in 1882 approved the sale of 3,000,000 acres of public land to finance the construction of a new permanent capitol. 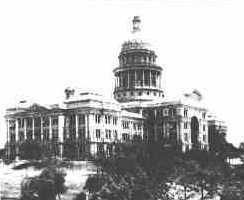 Dedicated in May 1888, the present capitol in Austin has now served the state for over 100 years. 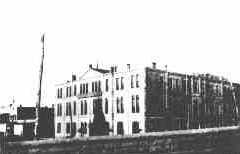 Among the first improvements for the new capitol were wiring for electric lighting and the construction of an iron fence around the perimeter.